One of the great things about fishing is that it is a sport of almost unlimited possibilities and options. That includes where we fish, what we fish and how we fish. It’s this last thought that was the inspiration for this article. I wanted to put together a buyer’s guide for one of the most overlooked and underrated types of sportfishing boats on the market – inflatable fishing boats! These highly portable and relatively inexpensive watercraft come in several configurations and go by many names – inflatable fishing raft, inflatable fishing kayak, RIB, blow up fishing boat and inflatable fishing pontoon are just a few of them. But, regardless of what we call them, they offer yet another great option for those of us who like fishing out on the water. But why should we bother with this type of fishing boat when, it seems, there are so many other traditional options already? Well, there are many reasons for owning one of these, both as an alternative and a supplement to more conventional sportfishing boats, and we’ll get to some of the more important ones here soon. In addition to discussing why owning an inflatable fishing craft makes sense, we’ll also get to what qualities and features are important. Before you pull the trigger and buy yourself an inflatable as a primary fishing boat or just to add variety or versatility to how you fish, there are some important things you will need to consider. Specifically, you’ll want to know what qualities and features to look for in your search. Lastly, you’ll also want to know what are your choices in terms of what’s out there on the market currently. There are many types of fishing inflatables available today – more so than ever – and in this guide, we’ll take a look at a few of the most popular offerings. The goal here is to arm you with enough practical knowledge and information to allow you to confidently choose the best inflatable fishing boat for you and your needs. Ok, let’ s get to it. Why an Inflatable Fishing Boat? 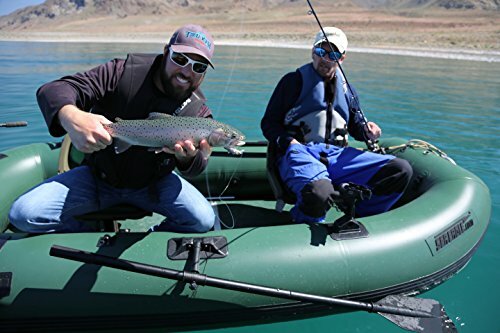 Why do many anglers prefer inflatable boat fishing over more traditional watercraft such those made from fiberglass or aluminum? Well, because they offer a host of advantages for anglers, things you just can’t get with other types of fishing boats. Below, we’ll look at 3 of the most compelling advantages of an inflatable fishing boat. Portability is one of the main reasons why they are so popular with anglers, if not the most compelling reason. Because of the pliable and lightweight design of these watercraft, they couldn’t be easier to transport. Compact and light by design, most inflatable watercraft can easily be transported without being heavy or cumbersome. In fact, most inflatables come with their own carrying bag, which is often no bigger than a medium to large size duffel/travel bag. For those who may not want to collapse their larger rigid inflatable boats (RIBs) or want their inflatable craft ready to hit the water as fast as possible, there are small, lightweight canoe/kayak trailers that will easily fit the bill. Regardless, inflatable fishing boats are ideal for traveling to remote locations on foot, allowing you to get to spots that wouldn’t normally be accessible with a traditional boat, canoe or even kayak. One of the things I love about inflatable boats is that they take up very little space when deflated. They are easy to store, even in limited spaces such as in compact cars. They are especially attractive to anglers for whom space is a big issue, such as those living in an apartment or those who lack the space needed to store a standard boat or even a fishing kayak at home. And, of course, there are many who just prefer the low-cost and convenience benefits related to owning an inflatable vs a conventional boat. But regardless of motive, an inflatable fishing boat is a fun and convenient option for getting out on the water for a day of fishing without many of the normal transport/ storage restrictions of other boat types. A big selling point of inflatable boats is their affordable cost. Though there are some models selling for well over a grand, the vast majority are affordable and can easily fit into most budgets. Compare that with other boat types, even small ones, that can run you a few thousands of dollars and more. 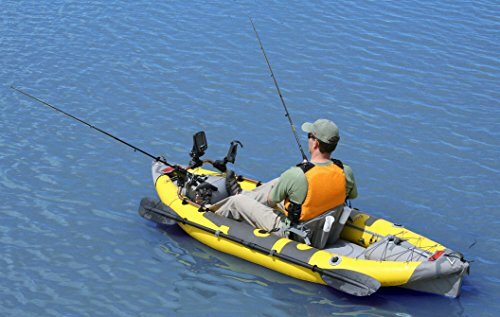 Even a small Jon boat or fishing kayak can cost you substantially more than the average fishing inflatable. Speaking of expense, the inflatable fishing boat gets a big thumbs up for its ultra-low maintenance costs. With a traditional fishing boat, there’s a significant amount of upkeep that needs to be performed, many of which require spending money. Time and monetary expenses are significantly lower with inflatables. Fuel costs with an inflatable are also significantly lower. Most of us will simply use manpower (paddling) to get around in one. But even for a larger inflatable that can be mounted with a small gas-powered outboard or electric trolling motor, the cost to operate will be nothing close to that of a conventional boat because of the inflatable’s ultra-lightweight design. Ok, before you plunk down your hard earned dollars on an inflatable craft, you have to know what to look for. Regardless of the type of inflatable or price range you eventually decide to go with, you have to know what qualities and features are found in the best of today’s inflatable fishing boats. While today’s offerings come with a boatload (pun intended) of cool and useful features, I’ve tried to stay focused on those that are most important. As you begin your search, you will find that many of today’s top inflatable boat brands are putting out products with qualities and features on par with the best of other types of fishing craft. Construction: What Is the Boat Made Of? Ok, as the name suggests, inflatable fishing boats are made primarily of synthetic materials that are filled with air to provide the boat with buoyancy. However, current inflatable fishing craft are not the simple rafts of yesterday. Those were little more than inflated rubber tubes – think Goodyear tubes, if you will. Present-day productions are made of much more durable and sophisticated materials. So, what are the top-rated inflatable boats of today made of? 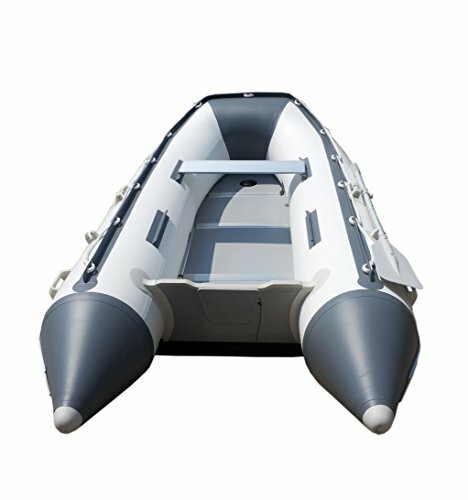 Well, new models are made from one of 3 synthetic materials – PVC, Hypalon (used in rigid inflatable boats – RIBs) and Polyurethane. Having said that, we are going to briefly discuss the last two but focus on PVC-made inflatables. That is because 99% of what’s for sale on the market is made from PVC (polyvinyl chloride) synthetic fabric. Now, so there’s no confusion, this is not the same PVC that you might see in the plumbing throughout your home. That is a hard PVC. The material used to make inflatable fishing boats/dinghies, kayaks and pontoons is a soft PVC variant. But, first, let’s talk briefly about Hypalon and Polyurethane boats. Hypalon and Polyurethane-made inflatables, made of a heavier and stiffer material than PVC types, are the most abrasion-resistant and durable. However, this degree of quality and durability comes at a cost. Both are more as expensive PVC, with Polyurethane being the more cost-prohibitive of the two. As such, you hardly see Polyurethane fishing rafts for sale through retail outlets, though Hypalon-made inflatable watercraft are readily available. Regardless, PVC is the way to go for the vast majority of those reading this guide. They fit the bill for what most of us are looking for in an inflatable fishing boat in every way. They are lightweight, resist abrasion and puncture well when in the water and wet (not so much when dry, however) and will provide you with excellent overall performance while costing much less than the other two types mentioned here. Furthermore, rapid degradation by the elements, a big problem of the past, is no longer the issue it once was. That’s because contemporary inflatable PVC watercraft are made of heavy gauge 1100 denier (0.9mm) PVC fabric or higher and treated with UV, heat-resistant coatings and other compounds that slow down the deterioration of the fabric. Just as crucial as the fabric material is the method by which the boat’s seems are held together. There are essentially two ways by which inflatables are assembled. The first is by using adhesives (gluing) to create a strong bond between the PVC fabric seems. Most inflatable watercraft today are assembled using adhesives. Well-constructed PVC offerings use German-made adhesives. This is important because Germany is the global adhesive market leader and is universally recognized for producing the highest quality adhesives in the industry. However, no matter how well the seams are glued, eventually the elements (UV, heat, saltwater, etc.) will do their work on them and the adhesive will degrade. It’s inevitable. The good news is that it doesn’t happen overnight and there are plenty of seam-seal adhesives and repair kits available to re-seal your inflatable. The second method of assembling materials involves using heat welding. Heat welding, or hot air welding, bonds the PVC materials by using high heat to melt fabric pieces together. This method is superior to adhesive bonding and creates a stronger, more durable seal that greatly reduces seam failure. Size: How Big a Boat Do You Need? Thinking about how big or small you want your boat to be is a good starting point. In other words, how you will be using it. What are your needs (or wants)? Will you be fishing just by yourself? A one-man inflatable fishing boat is plenty then, in that case. One-man boats are usually cheaper due to their smaller sizes. 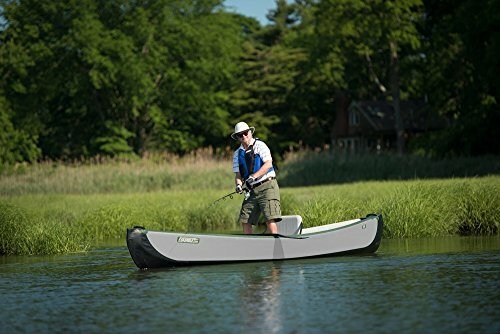 Kayaks and one-man pontoons are always a popular option for solo fishing trips, being compact, lightweight, and easy to maneuver in the water. But perhaps there will be at times you may want to fish with another angler or two. Two-man inflatable boats are a popular choice, with rafts and canoes typically being good options. They will be heavier and larger than a 1-man, for obvious reasons, but are a fantastic investment for friends and family that love to fish together. If you enjoy fishing in groups you may even want to opt for a 4 or even 6-person inflatable dinghy. How about room for your all your favorite fishing gear – and your friends’ gear? You’ll need a boat that is big enough to accommodate all that as well. So start off by thinking about the size of the boat you will need. 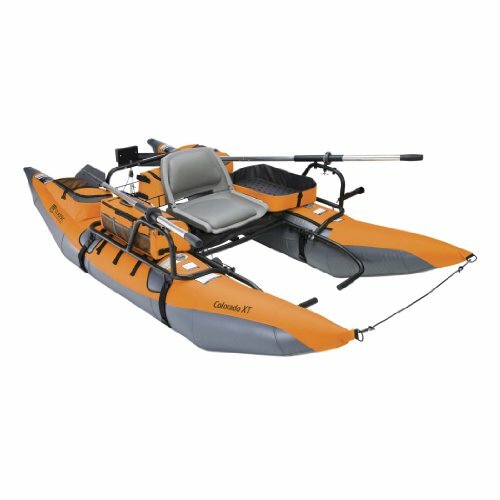 Depending on the factors mentioned above you could go with one-man inflatable kayak or a small Inflatable fishing float tube barely longer than 3 feet; or you could supersize all the way up to a 15 ft inflatable dinghy capable of carrying all your gear, up to 8 people (though fewer if fishing) and an electric trolling motor or even a small gas outboard motor. Keep in mind, however, that the bigger the boat the more expensive and heavier it will be. An inflatable over 12 ft can cost over a week’s wages and weigh over 150 lbs depending on the model. Also, although they can be stored in a carry bag, large inflatable boats may require more than one person to carry them. Luckily, however, there are plenty of compact transport options to help you get your inflatable from the car to the lake. What Are the Boat’s Capacity Ratings? There are 2 important types of capacity ratings you will see with any type of boat. You will frequently see them listed as “persons capacity” or “passenger capacity”, and “max capacity”/ “max load capacity”. Passenger capacity is simply the maximum number of people your boat can safely carry. This information will be located in your owner’s manual or in some other paperwork and also often on the boat itself. The max load capacity rating is the maximum weight your watercraft can safely support. This includes any and everything that you put into your boat. That will include people, your tackle, storage boxes, food, etc. It also includes the weight of the motor if you are using one (more on motors below). So when looking at inflatable boats be sure to check out their recommended capacities for both the maximum number of passengers you think you’re likely to have onboard with you as well as the total or maximum load ratings for the combined weight of everyone on the boat plus the weight of all the gear and accessories. Are you going for a solo fishing trip or taking a buddy along for the trip? It’s important to consider your fishing habits when evaluating inflatable boats, as you want one that offers enough capacity to suit your needs. Power Considerations: Paddles or Motor? Consider how you want the boat to be powered before buying, as the differences in performance and overall cost are quite notable. Most models come with paddles or oars to power your movement across the water, but some also come with the option to add your own motor. Many of today’s larger and more expensive inflatables come with a suitable transom motor mount for adding an electric trolling motor, or even a small, lightweight 2-stroke or 4-stroke gas outboard motor. Look for marine-grade plywood or aluminum (even better) transom mounts for durability. Inflatables that accept a motor will have their max motor horsepower (HP) ratings listed in the same way other capacities are listed. It is important to follow the manufacturer’s recommendations with regards to this as overpowering any inflatable can be as dangerous as overloading it. For those who know from the start they only want a motor-powered setup, buying an inflatable boat/motor package may offer attractive savings. Manufacturers such as Seamax have teamed up with top outboard motor brands like as Tohatsu to offer several inflatable boat package deals. Basic/Standard Accessories: There are certain essentials that all boats in this category should come with. We’re talking here about things like aluminum oars, a durable high-capacity pump to inflate your boat fast, a carry bag for storage/transportation, and a simple repair kit for minor fixes. A few other basic but important standard features include stainless steel tow rings, heavy-duty (quick inflate/deflate) valves, carrying handles for easy transport when inflated, and one-way drain plugs. These items should be expected and standard in even inflatable boats geared towards beginners. Multiple Air Chambers: Having multiple air compartments increase the boat’s buoyancy and adds to safety on the water. Top models often have 3 or more chambers. Tackle storage: This is an important feature to consider, whether your boat comes with dedicated storage or enough free space on the deck to store your tackle and other gear. Rod Holders: If you’re going to be fishing on your boat, rod holders are must-haves, simply put. While you can always buy aftermarket rod holders for your inflatable dinghy or canoe, having them from the start is a great convenience. Seating: This is one of the most important features of any boat. After all, you are going to be spending most of your time seated while in your inflatable. So you might as well get the best option for you. Soft, cushy inflatable seats are nice if comfort is your main objective. They are easy to set up and deflate and add almost no bulk to storage. However, they do not provide the best stability while fishing. These types of inflatable seats/cushions are found on less expensive boats. Aluminum bench seats or aluminum frame seats, while maybe not as comfortable as inflatable seats, are much sturdier and better for fishing. The only possible downside is that they do add a little to the boat’s carry weight and bulk. Even so, they are the way to go. You’ll find them in higher quality, more expensive inflatables. Also, consider boats with seats that can be adjusted forward/backward with some, particularly on fishing pontoon boats, that swivel… now that’s versatility! Air Deck/ Floor: Air floors are simply an inflatable floor. Like your inflatable tender or dinghy, they can be quickly inflated for use and deflated for storage/transport. They are lightweight, rigid/durable enough for standing while fishing and offer the convenience and fast breakdowns for storage. Drop-stitched air floors are a step up in durability. However, they are not as durable or as forgiving of heavy use or the occasional accidental abuse as hard floors, and they can lose air naturally, making them feel less than secure while fighting fish standing up. Floor Boards/Panels: These are made of aluminum (anodized for saltwater use), marine-grade ply board or some similar material. If you plan on doing a lot of serious fishing, I recommend a boat with hard flooring. You will not only get better durability but also superior performance all around. No need to worry about dropped fishing hooks and knives damaging your floor, and as a bonus a rigid floor allows for planing in the water for more speed. But where an aluminum/wood floor stands out is in the stability it provides when you are fishing standing up. Current floor panels come in relatively light, convenient sections that are locked in place by side rails and feel almost as sturdy as floors in traditional boats. The only downside for some is it that they do add a little more time to the setup and breakdown, and they also add a bit of weight and bulk for transport and storage. 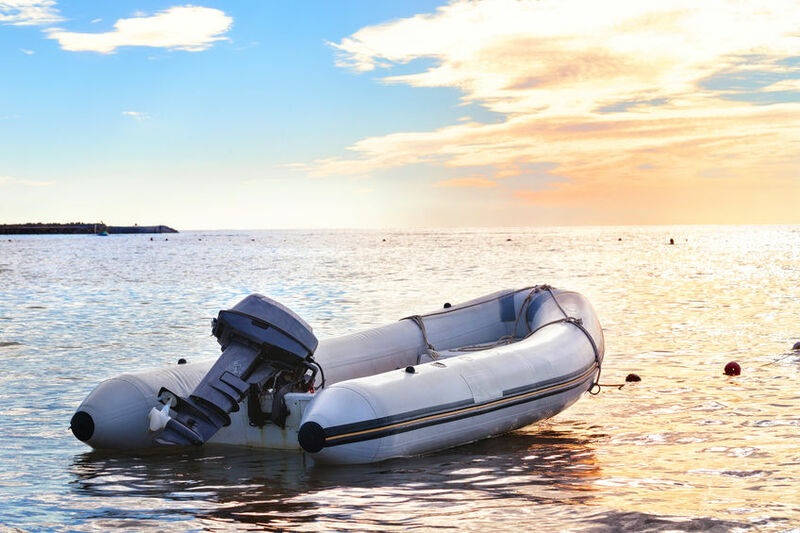 USCG Rated: Is the boat or raft U.S. Coast Guard Approved? This should be one of the first features you search for in any listing. 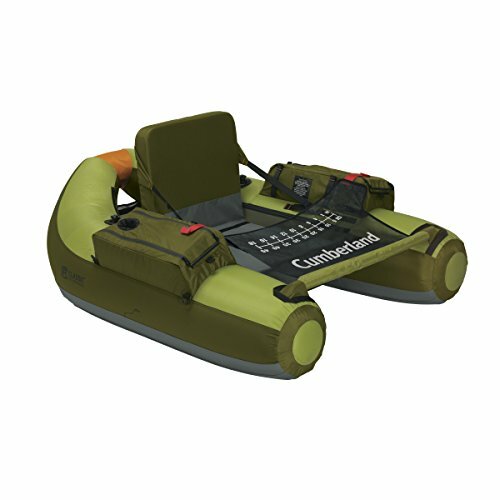 An inflatable watercraft that is USCG Rated is generally designed and made with higher quality standards and better components then non-rated counterparts. They may cost a little more but are well worth it. Warranty: A good warranty is important for obvious reasons, particularly with an inflatable. We all know that a warranty is something that protects you, the consumer, against defective product material and workmanship in a nutshell. But it is also a vote of confidence by the manufacturer in their product. Don’t let anyone fool you into thinking that an unusually short warranty period – by industry standards – is a good thing. Contrary to some statements, logic does not support the notion that a product has a shorter warranty period because it is so well-made. When looking for an inflatable fishing raft, canoe or kayak to buy, look at the warranty being offered. While a 1 year warranty period is standard in quality inflatables, I would be more interested in one that comes with, say, a 2 year or even 3-year manufacturer’s warranty. If the maker is truly confident in their product, they will show it with a longer warranty, not a shorter one… period! Finishing Touches: Some of the other important premium features you’ll find in higher-end inflatable boats include an inflatable/air keel for improved control and to help the boat plane effortlessly, and built-in oar locks for more comfortable rowing. There are many types of fishing inflatables available on the market today, all of which come in various shapes, sizes and option offerings, so there is certainly no shortage of choices when looking to buy one. The inflatable listed below are just some of the most popular types available for sale. 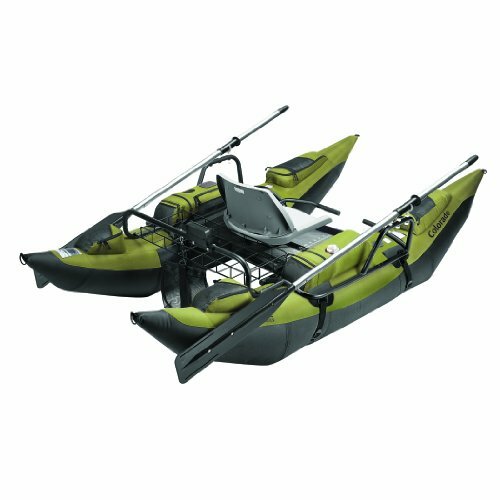 One of the most versatile and popular types of inflatable fishing boats, an inflatable kayak looks very similar to a traditional kayak, making them ideal for streams, ponds, rivers, lakes, and even sheltered bays. Available in various sizes, some kayaks are designed for recreational fishing, while others are designed for serious fishing expeditions. They tend to be quite comfortable to sit in as they are mostly air and fabric, so you should avoid strains and fatigue when sitting for long periods. You will most likely be padding to get your destination when using an inflatable kayak. This makes them best suited for large bodies of open water, such as a lake, although you may need more practice for paddling in challenging environments such as rivers or bays. Paddling without proper technique may cause you to tire quickly, so it’s important to remember this if you opt for a kayak – it’s often a good idea to get some practice in a lake or pond before taking on more difficult locations. For those who don’t want to work that hard to get around in the water, most of today’s top inflatable kayaks can accept trolling motors/small gas motors via a motor mount for added convenience. Another popular inflatable watercraft, pontoon boats feature two large inflatable bladders on either side that connect to a smaller curved bladder or a metal frame depending on the design. They are ideal for solo fishing excursions (they also come in 2-man configurations), especially on open lakes, featuring a single seated area and not much else. Inflatable fishing pontoons are a great option for getting up close to fish without disturbing them, as they can smoothly navigate through calm waters. Basic models are usually manually operated with oars, while top models sometimes feature motor mounts, allowing small gas or electric motors to be attached for more efficient – and less tiring – navigation. Additionally, pontoons may come with other features for a more complete boat, such as swivel seats, road holders, and motor mounts. They won’t provide lots of room but are more spacious than a kayak, although framed pontoons sometimes have additional storage space. Canoes are a more recent addition to inflatable fishing boats, with advancements in drop stitch technology making it now possible to build a canoe from inflatable materials. Drop stitching allows a high amount of air pressure when inflating the boat, resulting in a much firmer craft that closely resembles a plastic or wooden canoe. Larger than a kayak, inflatable canoes also offer better capacity as they are usually capable of seating two people, along with spare space for tackle and other supplies. Paddling with an inflatable canoe offers near-silent approaches on the water, which is one of their biggest advantages, as is their incredible durability in rough water – they can withstand rapids without suffering any damage or filling up with water. Like their PVC cousins, the kayak, some inflatable fishing canoes can also be outfitted with an electric trolling or even small gas motor. An inflatable fishing dinghy is much the same as any other inflatable boat, with the addition of features that anglers will find useful. For instance, inflatable fishing rafts tend to come with attachments for motors, rod holders, and often canopies to keep you dry. You sacrifice some speed for the additional space and comfort, but many anglers are more than happy to do this. There aren’t any solid parts to dingy rafts, as they always come with a soft body, and a lack of solid anchor points means you can’t use heavy motors. That said, a lightweight electric trolling motor or a small 2-stroke/4-stroke outboard can be used on some of the larger inflatable dinghies, which makes them much easier to operate. Last but not least is the fishing float tube. They represent the ultimate in inflatable fishing compactness and portability. If you want something you can easily fit in the trunk on even a small car, this is it. But don’t be fooled by their diminutive size. The best of today’s fishing floats are made to quality standards that rival other types of inflatable craft and can handle up to 300 lbs easily. They also don’t lack useful features. These ultra-compact fishing inflatables boast such standard equipment as padded seats with adjustable backrest, rod holders, storage for your tackle and much more. These little fishing boats are great options if budget and extreme portability are your most important concerns. Well, we’ve come to the end of our little guide. But given the great selection of options for inflatable fishing boats today, it helps to know what to look for in a boat to ensure you choose something suitable for your needs. Hopefully, this guide makes the selection process a little easier. This entry was posted in Fishing Tips & Other Wonderings, Tackle/Gear Reviews & Guides on June 2, 2018 by Dorado. John Pardal, aka Dorado, is the editor as well as an author for Reel Adventure Fishing. He has fished extensively up and down the U.S. Atlantic coast, throughout much of Florida and a bit of the Caribbean. John loves writing about all aspects of sportfishing and is passionate about conservation and promoting sustainable fishing. Nice guide. I’ve always thought of inflatable watercraft as emergency boats, not so much for fishing. But they make sense, and the idea of not needing a trailer is a big incentive. Do you favor any particular brand? Hello Hugh. Yeah, inflatables for fishing have come a long way in the last few years and there are so many good choices today. As for brands, I like Classic Accessories’ Colorado pontoons. Sea Eagle has also been around a long time and puts out great products. This is a lot of great info on inflatable boats! I’m actually looking to get into fishing. I never even heard of inflatable canoes until now. I feel like a much more educated consumer as I begin shopping around for the right inflatable boat. I now know what to look for (and what NOT to look for). Thanks for the great info! Hey Andrew, thanks for stopping by. Yeah, inflatable boats are convenient and a lot of fun. They are also a good option for beginners looking to get out on the water for some fishing. Glad you enjoyed the guide.